We believe everyone should have the tools and opportunities to reach their personal best, and we know that nutrition is key. So why settle? Our Frozen Smoothie Kits are designed with elite sports nutritionists as an alternative to unhealthy bottled drinks and your secret weapon for everyday performance. We're a Prince's Trust business on a mission to fuel potential. 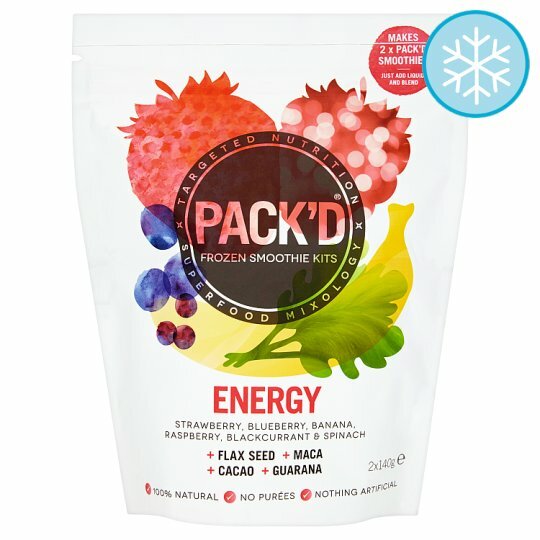 This pack contains two Energy Smoothie Kits, designed with elite nutritionist Matt Lovell. Each kit is a sophisticated mix of whole fruit, vegetables and superfoods, for the ultimate homemade smoothie. Providing up to 4.6g fibre and 3 vitamins & minerals to give you an energy boost. We recommend blending with 200ml of coconut water, apple juice or almond milk.